Yesterday in my review I said that The Counterfeiters was the weakest Best Foreign Language film of the decade, but that was wrong. I totally forgot about the 2005 South African winner Tsotsi, which I found to be trite and contrived. The very fact that I forgot all about it when thinking back on the past winners should tell you something right there. That gives The Counterfeiters a slight boost in Academy history. Tsotsi's victory over the far superior (and more challenging) Palestinian entry Paradise Now and Germany's gutwrenching Sophie Scholl - The Final Days was a travesty. For a look at something far better to have come from South Africa, check out Nick Plowman's Fataculture. 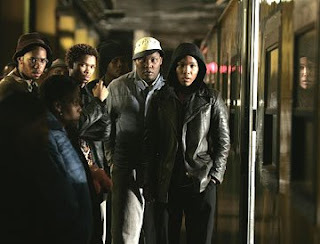 I haven't seen Tsotsi -- and I never will. I mean, why should I?! -- but definitely agree about Nick. Fataculture forever!!!!! I have to disagree but only slightly. To me No Man's Land 2001's winner of Best Foreign Language picture is the worst winner of the last decade. And it beat Amelie, which is in itself a travesty of the highest order. However, Totsi winning over Paradise Now was certainly an error on the part of the Academy. And, as a matter of personal taste, Lives of Others over Pan's Labyrinth was a bad choice. Yet I confess both of those films were worthy and I was okay with that choice. And somehow I have managed to not see Sophie Scholl. I will have to check it out. I am really sad about this post, not because you are putting down what many believe to be the greatest South African film ever made, but because I, a South African Film Freak, wholly agree with you. I think I would have been far happier if Paradise Now or Sophie Scholl won, but I cannot turn back time.